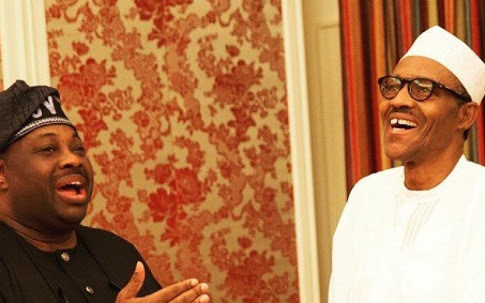 Dele Momodu says he wishes President Muhammadu Buhari could liberate himself from the cabal that has held him and his government hostage. Momodu said this in reaction to the critical comments Aisha Buhari, the president’s wife, made about him the slow progress of his administration. She had asked Nigerians to stand up to the two people who are allegedly hindering the progress of Nigeria under the leadership of her husband. “If 15.4 million people can bring in a government and only for the government to be dominated by two people or three people, where are the men of Nigeria? Where are the Nigerian men? What are you doing? Instead of them to come together and fight them, they keep visiting them one after the other licking their shoes (I’m sorry to use those words),” she had said. Aisha has repeatedly alleged that Buhari’s government had been hijacked. Taking to social media, Momodu described Buhari as a man in “gilded cage”. He said while he likes Buhari’s personality, he does not like his leadership style. “I like BUHARI as a simple, humorous personality but his leadership style leaves much to be desired and his cabal won’t let the competent people around him function,” Momodu Wrote. Hey Buddy!, I found this information for you: "I Weep For President Buhari, His Wife Has Cried Out Endlessly – Dele Momodu". Here is the website link: https://headlinenews365.com/i-weep-for-president-buhari-his-wife-has-cried-out-endlessly-dele-momodu/. Thank you.